So I finally finished the cute tank top I have been working on! It turned out better than I imagined it would! Usually when I make myself a garment it doesn’t fit as well as this one does… I made a couple adjustments to the pattern, but this is a super simple, quick pattern if you are looking for something to make for yourself this summer! It is on Ravelry for a free download, by Kim Guzman… Shell Shell is the name of the pattern…Click here to check it out. I made mine using a Black Cotton Yarn from Knit Picks! 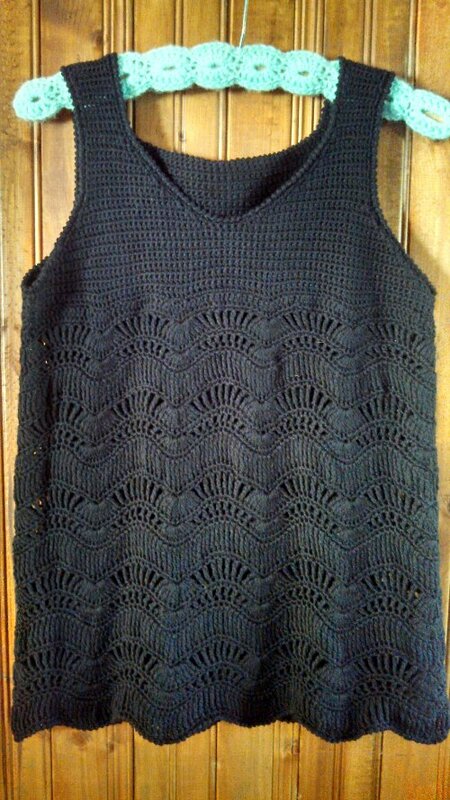 It is a little hard to see the details in the picture, but it is really cute… I am going to buy some bright Cami’s to where under it so it shows off the pattern! Tell me what you think!!! Not the best quality picture,,, But it is really a comfy cute Shell! I am about halfway done with my next True Colors Afghan for my Etsy Shop… I will post the pictures when it’s done… Summer seems to be a slower time for crochet… But I still do a couple of hours each evening! So here is to my New Shell and Summer Crochet! Find me on Facebook and check out my items on Etsy,,, I will be adding more tomorrow! Knitting & Crocheting Blog Week…. Wow! That’s lovely. Really beautiful. The top looks amazing! Great job!